Last night, the weather could not have been more perfect as SummerStage celebrated its 25th year with an enchanting and brilliant dance performance. With the world premiere of a specially commissioned piece by Complexions Contemporary Ballet, "On Holiday," there was no doubt that the night was going to be a spectacular one. However, before this highly acclaimed dance troupe came onstage, we were treated with the two winning dance groups of the Dancin' Downtown at The Joyce Theater competition. The night started off with a lovely piece performed by Innersoul Dance Project. As 10 dancers moved around a wooden picnic table-and-chair setting, a melody played in the background that was as repetitive as the song's title, "Footprints", suggests. However, the dancing itself was anything but. As girls moved in and out of the main group to dance duets with the male, we were treated to a beautiful piece that showcased strong technique and passion. Finally, the music faded out before the dancing stopped and the only sound we heard was the heavy breathing of all dancers as they completed their final picturesque jumps. Immediately following, the New Jersey Dance Theater Ensemble assembled on stage, featuring a cast of 10 young females and one male. The group was wearing all black, alluding to a piece that was going to be anything but a picnic. And sure enough, as a strong African beat song faded in and out, a woman's voice rang out as she slowly began to sing the word "Emergency" in an almost chant-like manner. With frantic but controlled energy, the dancers began an extremely powerful piece, constantly breaking off and coming back together in groups. With their hair loose, the dancers' energy remained strong throughout the piece as everyone tirelessly threw themselves around the stage. When it finally came time for Complexions to perform, beloved co-Artistic Director and Resident Choreographer Dwight Rhoden introduced the company to resounding applause from the audience. Co-founded with another Alvin Ailey dancer, Desmond Richardson, Complexions is a dance company committed to bringing out the diversities of all dancers. And yet, as diverse of a background each dancer may have, they all have one thing in common: every dancer is as strong as the next. The women match the men in musculature and all exhibit beautiful arched feet and seemingly endless lines. Aimed to remove boundaries and go where no dance style has gone before, Complexions introduces to its audience a repertoire of pieces that are both culturally and stylistically exhilarating and fresh - leaving the audience with an out of this world experience. First on the program was "Mercy" - a dramatic piece that kept on building in frenzied passion as the dancers moved in and out of the red back curtain. The music itself was transcendent as it ranged from gospel music, to a preaching monologue, to spiritual chant. At the dance's most climactic point, the cast came out wearing white billowy clothing and holding black buckets as they took up the entire stage and danced with primal passion, leaving the audience literally at their mercy. Before the world premiere of "On Holiday," Richardson entertained us with "Moonlight" - a beautiful solo choreographed by Rhoden. As nighttime descended on the audience, a single spotlight shined on Richardson as he jumped with as much weight as a feather and showcased his flawless extension and lines. Contrasted with Richardson's poignant and tragically emotional solo was the vibrant and colorful premiere we had all been waiting for. Featuring a montage of classic jazz songs made famous by Billie Holiday, "On Holiday" was performed by 4 couples in various colors (red, green, blue, and purple) and accompanied by Broadway legend, Billy Porter. An interpretation of love at various stages in a person's life, this piece showcased various duets that ranged from sassy and flirtatious, to violent yet passionate. Ultimately, however, each pairing danced together with such love and sensuality that it brought hope to our spirits - noting that requited love does exist. The evening ended with "Rise," an explosive piece exploring the "dizzying journey of life in all its complexity and ecstasy." With the songs of U2 as its accompanying music, the performance evoked a sense of a passionate counterculture generation that was powered by youthful imaginations. From the start, as one solo dancer ran in place (slowly at first, then picking up his pace), the audience immediately responded with hoots and applause - suggesting that this final piece was going to be as much an interaction between the dancers as it is with the audience itself. And quite the party it was. Spotting the stage with red, orange, and pinks, the dancers smiled throughout the entire piece and seemed as though they were having the best times of their lives. Their happiness spread from the stage to the audience as the final song, "Beautiful Day" left the audience jumping and clapping rhythmically to the beat. 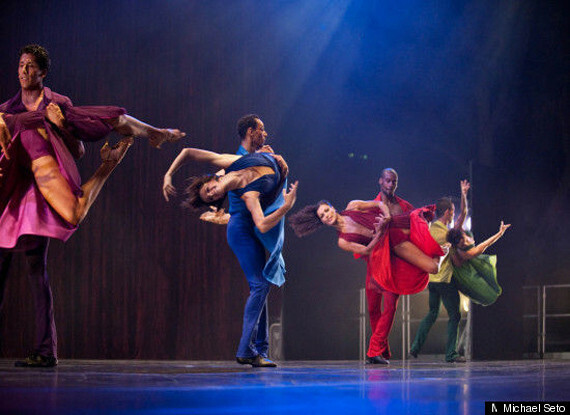 Complexions Contemporary Ballet is a treat. Audience members trickeled out, clearly inspired, some staying behind to show off their moves, and with comments such as "so exhilarating" proliferating. The company's beautiful and diverse dancers celebrate what it really means to dance and their technique and passion make something certain: they love to dance, and they do it well.